It looks like the ol' rumor mill is churning again, and this time it spat out some juicy plastic surgery rumors regarding long time actor, Tom Berenger, who you might remember from the movie Major League and Platoon. 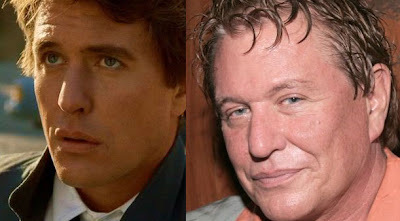 And while we're not completely sold on the idea, other sites have speculated that Mr. Berenger has undergone a facial plastic surgery procedure or two, suggesting the possibility of cheek implants and a mini facelift. However from the looks of this before and after photo, i don't see the obvious signs of cheek implant, but i will say that his face does appear to be a little tight, for a man in his early sixties. Perhaps Tommy has in fact undergone a mini facelift, or better yet, he may be experimenting with botox injections instead. Its kinda a toss up, wouldn't you say?